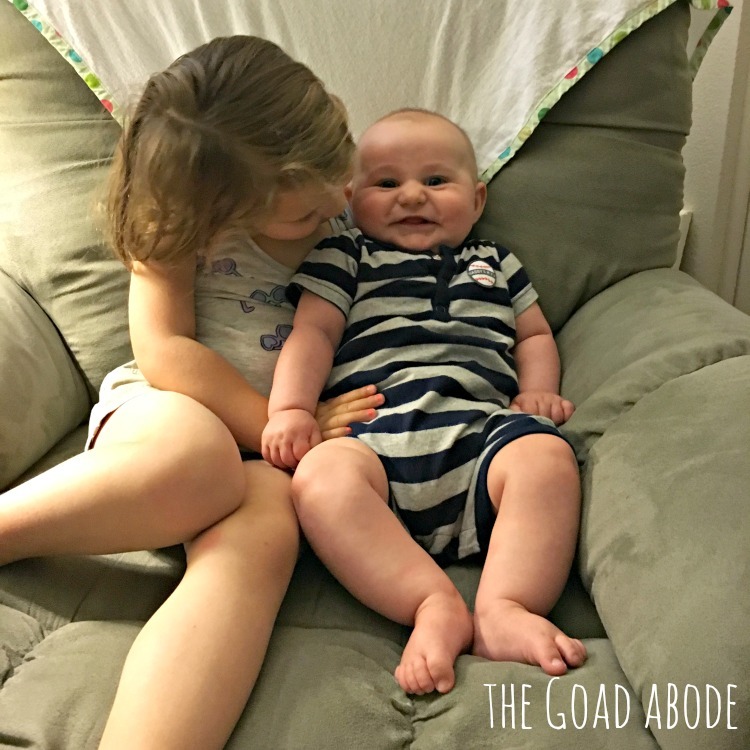 Capsule wardrobes for kids? Check out Wildly Co's summer capsules for girls and boys and use code BETH20 for 20% off your order through June 30. You can help refugee moms, here are five ways. All this hot weather, makes me want popsicles and this list has me anxious to try a few recipes. Traveling this summer? We are next month and I will certainly be trying a few of these suggestions for saving money. Also, on the subject of travel, hacks for parents. We've all heard about the gorilla and alligator, but did you hear about the mountain lion a mother fought off? Some solid suggestions on how to talk to your kids after the gorilla incident. Have you noticed how NPR reporters always have great names? Here's how you can determine your own NPR name. If 70s moms had blogs. This week we said a final goodbye to a piece of our heart in Massachusetts. We closed on our house. 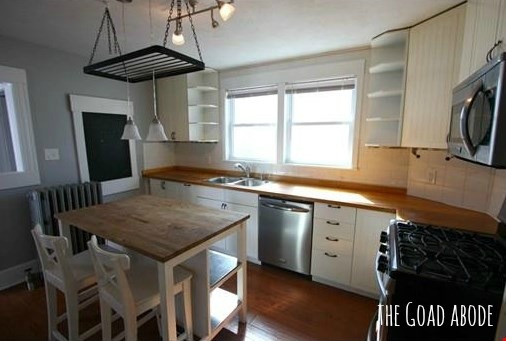 We bought the 90+ year old 3-bed colonial 11 months into married life. It needed a lot of work and took a lot of my husband's attention over the five years we lived there. I blogged and Instagrammed some of the renovations we made over the years we lived there, but I wanted to share the final pictures here now that it has been sold as a final tribute. We called it home for five whole years. That is a long time by our standards. Having both been quite transient in the years before we were married, it was the address that we both lived at for the longest period of time in our adult lives. 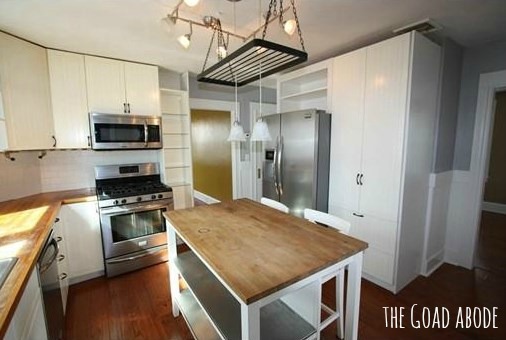 I loved the kitchen. It was by far the most lived-in part of the house. It was the first part of the house we changed. I remember washing dishes in the bathroom sink while we gutted it and using a headlamp to cook dinner on the gas stove because the electricity was off for something else my husband was doing in the house. My most vivid memory was when we replaced its windows hoping my husband really knew what he was doing while I stared at the gaping hole where windows should go. 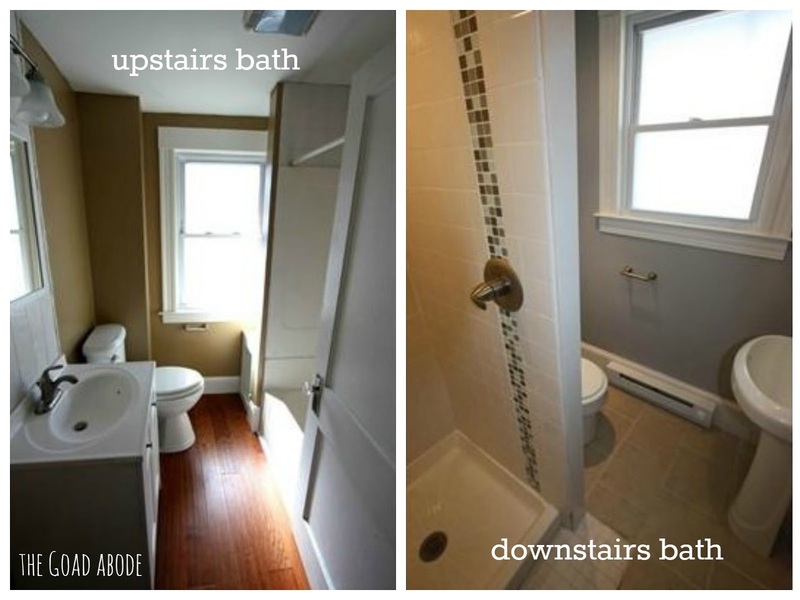 The upstairs bathroom was the first project that we finished and brought joy to my life. The changes from a weekend of painting and installing a new sink, were so drastic I claimed the paint color, warm caramel, changed my life. I may have been a bit dramatic, but it was such an improvement from the lavender walls and ugly pedestal sink that used to live there. We also made some major improvements in the layout of one half of the house. 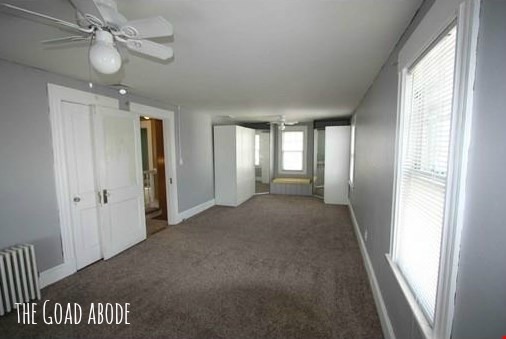 The master bedroom and living room were both fairly awkward because each space was so long and narrow. On the main floor, Brandon built a wall to divide it, which made the living area more live-able. 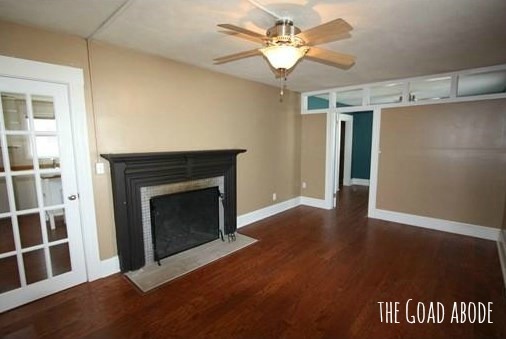 He also re-painted and re-tiled the mantle, making it a beautiful focal point of the room. Finally, he added doors to the space, making the room feel cozy when we used the fireplace. I will really miss that fire place next winter. In the master bedroom, it was the closet that needed the most work. When we bought the house, the closet was along the back wall, covering a full-size window. It was quite awkward (and a little weird) to have a window IN the closet. Brandon dismantled the closet and then installed his and hers closets from Ikea (we were spoiled to live just 20 minutes from Ikea). He also built a window seat between the closets adding to the cozy feel. I remember when he painted the walls grey. 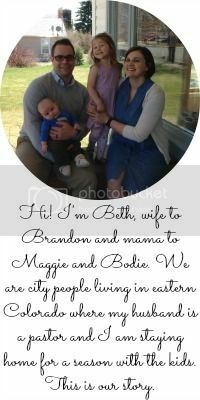 It was less than two months before Maggie was born, and I almost immediately felt it made the space more calm. 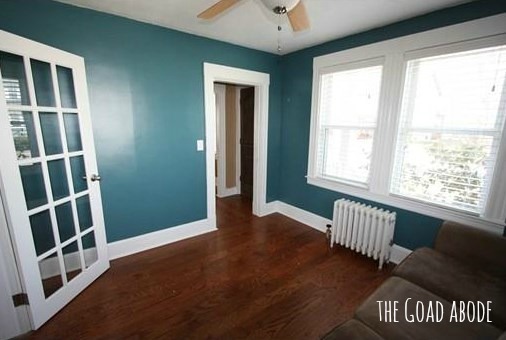 It was a vast improvement over the army green that had previously been on the walls. The dining room didn't see any drastic changes, but we did live without a finished ceiling for a number of months due to water damage from the upstairs bath tub. I remember the night a group of men from our church came to put up the new ceiling. I was so grateful to finally have that space finished and then we used oops paint (found on a must sell rack at Home Depot). 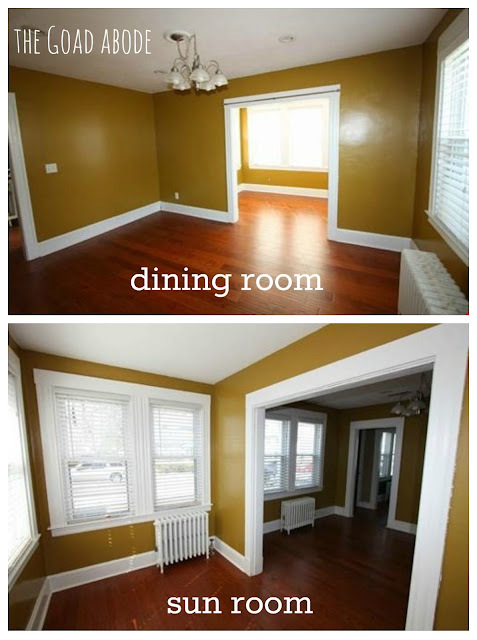 I don't think I would have thought of painting the walls mustard, but we loved how it turned out. It was a good house. There were times I thought we were in over our heads and times it was a haven, especially during the hard New England winters. We saw record snow outside its windows in 2015. It was the home where we brought our babies home from the hospital. Goodbye, red house. 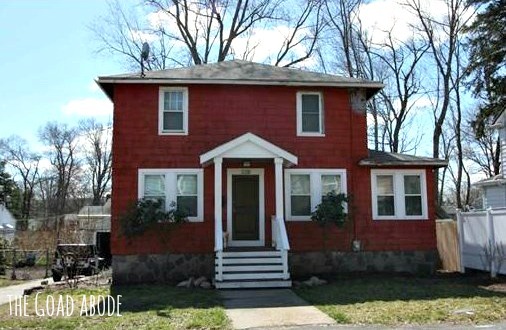 We affectionately refer to it as "the red house" when talking to our two year old daughter who remembers it. Brandon painted the exterior red last fall and it's the way I want to remember it. Our red house, the sweet little piece of MA we had our names on it for five years. So long, old friend. Thanks for the memories. This kid is growing like a weed! He is 90-95th percentile for length and weight. He's been such a good eater-- I guess it's no surprise. 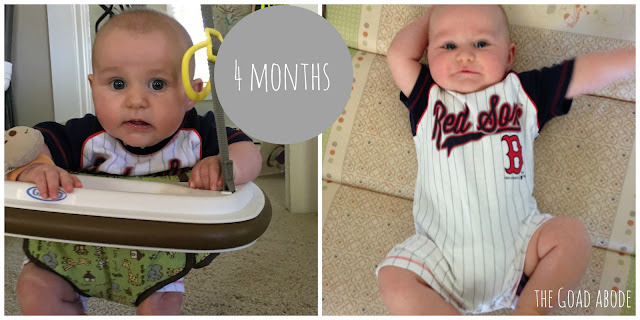 I love his little thigh rolls and showing them off in shorts and onesies. He continues to be a happy kiddo and seems to be more and more entertained by Maggie. He recognizes her voice and looks for her when he hears it (he has a similar reaction to mom and dad's voices too). We are pretty sure he's cutting his first teeth already. He is drooling a lot. Thank goodness for bibs! He also chews his fingers and thumb frequently. One thing I want to remember from Bodie's fourth month is that he started cooing when he's done eating. It's become the sign that he's done. He just stares up at me while cooing and smiling at me almost every time he's finished eating. The other day, I was fighting the almost daily naptime battle. My almost-three-year-old is only consistent about a few things and trying to get out a nap is one of them. Her brother was already sleeping in his room, so I was even more determined to win this round. I was tired and we had gone back and forth. She didn't want the sheets on her, she wanted a stuffed animal, she through the stuffed fox when I gave it to her, she wanted the sheet over her when I got up to walk to the door. It was miserable and my patience was getting very thin. I snapped at her and stormed out of the room. As I huffed up the stairs, I could hear her wailing. "Mommy, mommy please...I just need..."
I took a few minutes to myself in the kitchen. I may or may not have reached for the chocolate chips out of desperation. Okay, I ate a handful. I sat there replaying the situation and telling myself it was typical toddler behavior, but then I started thinking about how I did overreact. Would I have done that if my husband was standing there? Maybe. Would I have reacted if we were in public? I knew what I had to do. I walked back to her room and apologized. She was so quick to forgive me. I barely had the words out of my mouth and she was smiling and reaching for a hug. 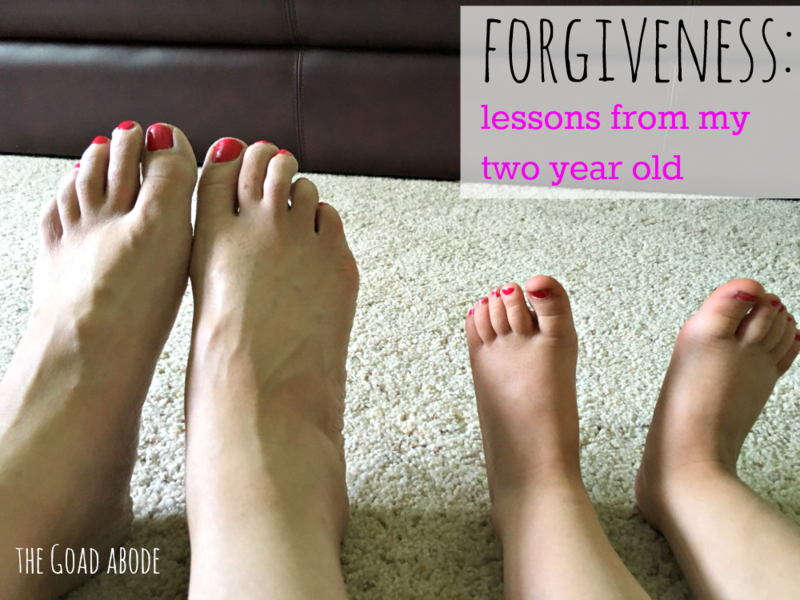 Why can't I be so quick to forgive when someone offends? Why do I have to give myself a pep talk to go apologize, even when I know she will be quick to forgive? Toddlers are amazing. She dispensed grace with love and didn't question me one bit. Once I apologized, she snuggled up to me and asked me to lay down on the bed with her while she fell asleep. Despite my ugly actions, it was a beautiful reminder of God's grace. I love how even mundane moments of parenthood can be reminders of the free gift we were given through Jesus death on the cross. It only took a few minutes to step back from the situation and look for grace. Where are you finding and giving grace lately? Looking back quickly at my May goals, I did not accomplish what I had hoped to. But I am excited for a new month with some new (+ old) goals to help me stay motivated. 1- Go on a date to celebrate our 6th wedding anniversary. We went out for Mexican food, but brought the kids. So this is still on the to do list! 2- Walk a minimum of three times per week (at least 30 minutes). I was not able to keep up with this. First, the stroller had a flat tire that took some time to repair and then I was just out of the rhythm. These are terrible excuses, but I am being honest. 3- Go to the zoo. We actually made it to the zoo twice in the month of May. Maggie has such a short attention span, I am excited we have the zoo pass because we have only spent 2-3 hours each time. 4- Keep up with my online Bible study. I was able to keep up! The sad news is that the study is being postponed until the fall, but I may just keep going because I'm really enjoying Seamless by Angie Smith. 5- Get my desk setup in the office. I had it setup and then a bunch of stuff ended up piled on top of it, so it is now unusable. As for the month of June, I'll need to keep some of these on my list because they are too important to just skip! 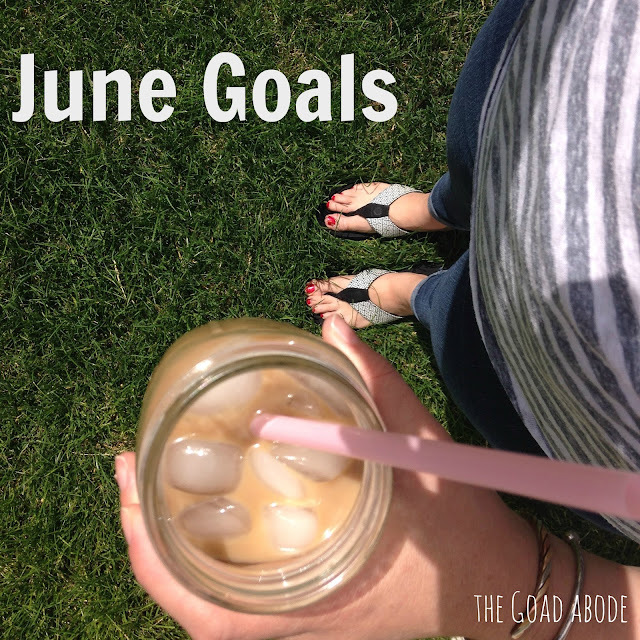 As an aside, this is my 6th month of goal-setting this year and most of that time has been as a stay-at-home mom. I find that these monthly goals help me to focus on a smaller period of time. While I may not always accomplish my goals, I have something to reach for and I do my best to revisit them throughout the month. I have note posted a visual reminder, but I think that would help me. This month, I will write them on my kitchen chalkboard. 1- Organize my desk space in the home office. I really want this space to be functional and reflect my personality. I have a bunch of things from my old office, so there is no shortage of things to make it look like my space. But I need to make time to actually get it set up. 2- Walk three times per week. My stroller is fixed (and I now know how to fix any more flat tires that may occur)! Also, I recently got a FitBit so that should help to motivate me (I love that it vibrates to remind me to move hourly). 3- Plan Maggie's 3rd birthday party. I can't believe it's already time to start thinking about and planning for her third birthday (in early July). I keep asking her what kind of theme she'd like and we can't seem to land on anything consistently. 4- Go on a real date! We have been terrible at planning ahead, but we must plan ahead to get a baby-sitter and where to go since there are few places nearby. 5- Help Maggie to memorize a Bible verse. She has been interested in learning hymns and praise songs lately, so I think she may be ready to memorize her first bit of Scripture. Two weeks ago I started reading Party Girl (it's not what you might think, the main character is an event planner hence the party part). I shared this story briefly on Instagram, but I think it's worth repeating here because it is such a great illustration of things I am learning to LOVE about small town life. There is so much I appreciate about this new season of slowing down lately. We have fewer commitments in some ways and the pace of life is different. I have been following Rachel Hollis online for about six months and have been wanting to read her non-fiction books, so a few weeks ago while I was at the town library with the kids I decided to stop and look for a book for me after we picked out some kids books. I knew they wouldn't have the books (it's a rather small library), so I asked at the desk if they could order it from another library. A week later I got a phone call telling me my book was in. When I went to pick it up, the librarian remarked, "it looks like a fun read. Would you believe no library in the state had it?" At that point, I was holding the book in my hand so I wondered aloud where it came from. "Oh, I ordered the whole series on Amazon," and she held up the other two books, Sweet Girl and Smart Girl. I thanked her and was a little embarrassed. I was not expecting her to BUY the books for me, but I am hopeful someone else in town (or maybe the whole state) will enjoy them! I finished Party Girl in a week and truly enjoyed it (this is my PSA for a fun summer read...and if you're local, then you know where to find them)! This is not to say I don't miss the city most days, but as the days and weeks pass, I am discovering things to love about small town life!